Condition: Damp patch top right, and two stains down the right hand side. Smaller damp stain at the bottom of the right hand side. Otherwise the item is in a good condition. THE SPECTATOR. PRESENTATION EDITION. ALTHOUGH A BATTERED LITTLE BOOK AND ATLAS OF THE WORLD IT STILL IS A WONDERFUL LITTLE BOOK. EIGHTEENTH EDITION REVISED TO DATE. USED PRE-OWNED DOES HAVE A BIT OF SPINE LIFT AT TOP YOU CAN SEE FROM FIRST PHOTO SEE PICS. With 8 pages of introductory letterpress and index'. However, I am not infallible and mistakes may occur. it will be an oversight and not intentional. 40 pages plus index. UK and overseas. both in the. Published: 1930 by George Philip & Son Ltd, London. Printed on good quality paper with another map on the reverse. Print size: 10 1/4" x 12" Map size 9" x 11". 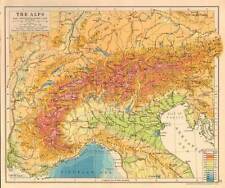 AN ORIGINAL ANTIQUE MAP OVER 80 YEARS OLD. CONDITION . CONDITION: Good; suitable for framing Signs of age marks yellowing and potential marks / spots / stains / foxing. 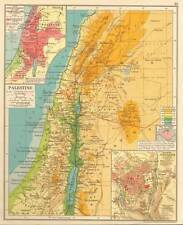 No date on the map, however this was series was published from the late 1920s through to 1930s. From pears' atlas of the world from a disbound pears cyclopaedia c1932 20cm x 12cm inc margins Thank you for looking at this item These maps have been rescued from a dis-bound book: Pears' Cyclopedia 45th Edition c1932 Size: These are small format Maps including Margins they are approx 20 x 12 cms All maps have either another map (indicated as double sided map in the title) or text on the reverse All my items are originals and in excellent condition unless indicted. Fold-out map. Partly shown in photo. Perfect for framing. The usual scuff marks but in general ok, a couple of tears on the folded parts. CONDITION: Good; suitable for framing Signs of age marks yellowing and potential marks / spots / stains / foxing. Minor tares and crumples to outer edges, Small hole along middle crease near the bottom. Published: 1938 by W & A K Johnston Ltd, Edinburgh. Printed on good quality paper with another map on the reverse. The serial map service Atlas 1939. This map is from a collection produced for. Approximate size of this FOLD-OUT map ~. If you like the item, but do not like the price. QUICK SALE AT A FAIR PRICE. Original map, not a copy, published by George Philip and Son in 1934. Other material on the reverse does not impinge to the front and is covered by the mounting process. Nice item, taken direct from the atlas. US GEOLOGICAL SURVEY MAP, NEW YORK-NEW JERSEY-HARLEM QUADRANGLE. The map shows Central Park, Mount Vernon and Yonkers. Fold-out map. Partly shown in photo. Beautiful old map on quality paper printed in 1939 rescued from a disbound atlas. THIS MAP IS AN ORIGINAL - OVER 75 YEARS OLD. If you like the item, but do not like the price. QUICK SALE AT A FAIR PRICE. The serial map service Atlas 1939. This map is from a collection produced for. Approximate size of this FOLD-OUT map ~. This is a genuine antique and not a modern copy. AN ORIGINAL ANTIQUE PRINT. If you like the item, but do not like the price. QUICK SALE AT A FAIR PRICE. Printed in bright colours each map also has a small explanation and key. Original map, not a copy, published by George Philip and Son in 1934. Other material on the reverse does not impinge to the front and is covered by the mounting process. Note we do not dismantle collectable books, only publications in poor condition and unlikely to be cherished for their own sake. (1936 OXFORD ADVANCED). 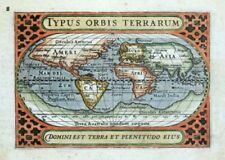 Beautiful map on quality paper and rescued from a disbound atlas. THE REVERSE OF THIS PRINT CONTAINS ANOTHER MAP. Beautiful old map on quality paper printed in 1939 rescued from a disbound atlas. THIS MAP IS AN ORIGINAL - OVER 75 YEARS OLD. If you like the item, but do not like the price. CONDITION . QUICK SALE AT A FAIR PRICE. 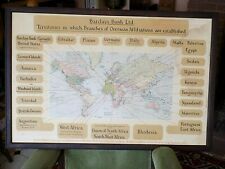 Vintage 1934 Rand McNally Map of India/Burma/Malay States ~ Color~ Ships FREE! Vintage 1934 Rand McNally Map of Japan/Taiwan ~ Color ~ Ships FREE! 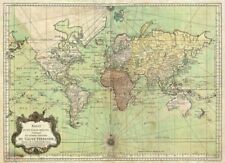 Vintage 1934 Rand McNally Map ~ The British Isles ~ Full Color ~ Ships FREE! 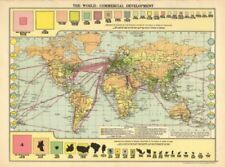 1933 Animated Map Of North America Designed By The Geographical Publishing Co.